My class completed this board in March as a conclusion to our study of graphs. To complete this project student pairs first prepared a question to ask a group of students. Then they thought of four answers the students might give. (For example, one pair of students decided to take a poll on favorite animals. Their answer choices were cat, dog, frog, and bird.) Students set up their information in a tally chart. I sent them to different classrooms throughout the school to complete their polls. When students returned they shared the data they had gathered and then worked on making the graphs. Each pair received a sheet of white paper, Lucky Charm marshmallows, and two clover sheets. They transferred the tally chart from notebook paper to one of the clover sheets. 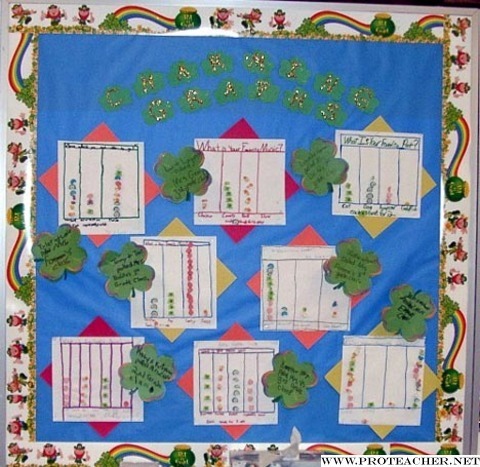 Then students wrote their names and the name of the class they had polled on the other clover sheet. Next, students used pencils and markers to make the outline of their graphs. They used the marshmallows to represent votes. Some students chose to have one marshmallow equal one vote while others decided that one marshmallow would equal 2 votes. This is indicated on the key on each graph. I had to display some of the graphs in the hallway because they wouldn't all fit on the board.